(PhysOrg.com) -- Apostolos Christou and David Asher from the Armagh Observatory in Northern Ireland announced the discovery of an asteroid near Earth called Asteroid 2010 SO16 and their findings were published on arXiv.org. While finding near-Earth asteroids is not unusual, there is something quite rare about this particular asteroid in that it orbits the sun in what is referred to as a horseshoe orbit. A horseshoe orbit gets its name because when viewed from Earths point of view, the asteroid appears to travel in a shape of a horseshoe. However, from the perspective of the asteroid, it is in a continual orbit around the sun. 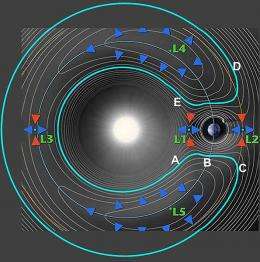 To better understand this horseshoe orbit it must be understood that objects closer to the sun will orbit at a faster rate than objects of a further distance. Imagine this asteroid is on an orbit around the Sun just slightly closer than that of Earth. Given the fact the asteroid is closer it is traveling at a slightly faster rate than Earth. Eventually the asteroid will approach Earth and what happens next is what gives the appearance of a horseshoe. Given that the Earth is larger its gravity will work to pull the asteroid away from the Sun, eventually pulling the asteroid into an orbit which is a greater distance from the sun than Earth. The asteroids new orbital track will then be slower than that of Earth, making it appear to fall behind and look as though it is going in the opposite direction. As both the Earth and the asteroid continue to orbit, eventually the Earth will catch up to the asteroid and the process will reverse, with the Earths gravity pulling the asteroid back into the smaller orbit. The belief of astronomers has been that horseshoe orbits are not stable. However, Christou and Asher have run simulations and they show that SO16 remains in this horseshoe orbit for anywhere from 120,000 to over a million years. Currently SO16 is traveling at one of its closest approach points and will hold a place in the evening sky for several decades to come. How much delta vee would be needed to get to it? Is it a prime candidate for a private venture landing? Very interesting and unique object indeed. Interesting! I remember reading some years ago, in Scientific American magazine I believe, about a pair of moons in one of the rings of Saturn which do the same kind of dance around that planet. They are about the same size and quite small but their mutual gravitational attraction does not result in them touching because at their closest approach to each other, the one ahead in orbit is retarded and so drifts slightly lower in orbit. The one following on the other hand is accelerated and thus drifts slightly higher in orbit. A question I have about the Earth companion 'horseshoe' asteroid is how it actually go captured. Perhaps it was a reverse slingshot effect around Venus which caused it to drift slowly out into proximity of Earth. Another question is: What effect does our Moon have on the asteroid? Surely the Moon must eventually cause it to get lost, through a slingshot effect? my curiosities lean towards how big is it, and what happens at the end of the 120,000 - 1,000,000 year range...where do the simulations show it going. That's almost exactly what I was thinking. If it's unstable, what's it's ultimate path? 300 meters is no big deal; it would be a local disaster but not a global one. If we had a decade or two to engineer a solution we'd be fine anyway, even if it was 10x that diameter. The more orbital neighbors we can identify; the better off we are in case one of them decides to try and crash our back yard BBQ party here on Earth. Well that's the question! "Nobody knows" is probably the comprehensive answer. The broadness of the 120KY to 10^6 years uncertainty time slot would seem to indicate that even though this asteroid's "horseshoe" orbit is pretty stable for a small object undergoing a fairly stable oscillation, any simulation exhibits sensitive dependence on initial conditions and after 120 x 10^6 years they never get the same final outcome.